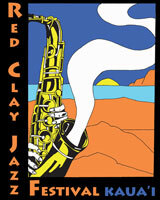 We are sad to announce that we will no longer be presenting the Red Clay Jazz Festival. It is with grateful hearts that we thank the rich variety of wonderfully talented musicians and artists who have performed in The Red Clay Jazz Festival over the past decade. Kudos to all the food vendors who brought ono Kauai dishes to the main event every year. Our deepest gratitude to all the hardworking volunteers who helped in any one or all eight of these Festivals and to the sponsors of these events. 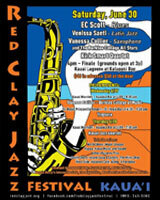 Mahalo nui loa to our devoted audiences for supporting the Red Clay. We hope that you will all continue to support America’s own original music – Jazz! The Kauai Concert Association (www.kauai-concert.org) was established in 1974 with a mission to bring world class music to Kauai. Over the years, the organization has consistently met that goal by bringing classical, contemporary, jazz, blues and dance artists to Kauai and providing artists with an opportunity to present their music in concerts, student assemblies and senior centers across the island. 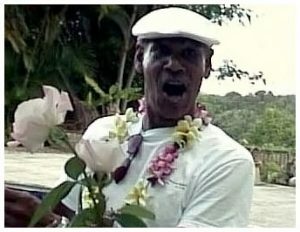 In 2003 KCA received the W. S. ‘Pete’ Robinson Memorial Jazz Fund. Pete Robinson retired to Kauai in 1996 and hosted the popular KKCR radio show Red Clay Review which featured the finest in ‘straight ahead’ and classic Jazz. In his rich melodic voice, Pete shared a deep knowledge of the players and the music with his growing audience. Pete lost his battle with cancer in September of 2000 and the W. S. ‘Pete’ Robinson Memorial Jazz Fund was established in his honor. The Fund is used to bring jazz to Kauai to be heard and experienced in concert as well as in classroom venues to ensure that Kauai’s children are exposed to this important original American music. 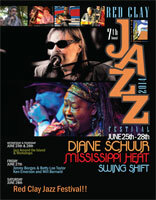 Since 2003, KCA has presented outstanding jazz artists such as Ernie Watts, Lew Soloff, Chick Corea and Gary Burton, Honolulu Jazz Quartet, Devin Phillips and New Orleans Straight Ahead, Kenny ‘Blues Boss’ Wayne, Bud Shank, Hawaii Jazz All Stars, Louis Hayes and the Cannonball Adderly Tribute Band and Ernestine Anderson. 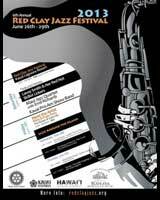 In 2008, KCA presented the 1st Kauai Red Clay Jazz Festival. The established Festival format highlights one of several jazz ensembles from Kauai, a second group of jazz artists from the State of Hawaii and headliner artists from the mainland or abroad.